One of my favorite things about Skyrim is the story. No, not that story. That thing about dragons, Stormcloaks, and that Valhalla place was pretty dumb. I meant MY story. Skyrim is built in such a way that no two people will have the exact same story. I'm not just talking about branching dialogue paths or taking quests in a different order, I'm talking about different adventures, different characters, different play-styles. If you can think of it, I'm pretty sure someone out there has tried to make it happen in Skyrim. "I AM CHUGGY IV, SON OF CHUGGY THE HAMMER, WHO CRUSHED ALL IN THE IMPERIAL CITY WITHIN DAYS OF HIS ARRIVAL IN CYRODIIL, SON OF CHUGGY THE SLAYER, WHO'S DEADLY DAGGERS KILLED ENTIRE TOWNS IN THEIR SLEEP, SON OF CHUGGY G, THE GREATEST OF THE CHUGGY LINE WHO MASTERED EVERY ART OF COMBAT KNOW TO ANYTHING AND KILLED A GOD OR SOMETHING. "I HAVE COME HERE TO CONTINUE WHAT MY FATHER AND MY FATHER'S FATHER AND HIS FATHER BEFORE HIM HAD SET OUT TO DO: TO KILL EVERYTHING IN THIS WORLD. THESE ARE THE WEAPONS OF THE MEN AND WOMEN OF RIVERWOOD WHO COULD NOT STAND UP TO MY MIGHT. "I DO NOT ASK FOR SURRENDER, BUT LET IT BE KNOWN THAT IF YOU WANT YOUR DEATH TO BE SWIFT AND PAINLESS, YOU WILL-"
"Another traveler, here to lick my father's boots." Chuggy glared down at the child, eyes seething with rage. "THE PROPER MODS HAVE BEEN INSTALLED. YOU WILL BE FIRST." Sure, some stories may share a few similarities. Player who participate in the Thieves Guild will have overlapping plot-lines and missions, and any Dragonborn who wants to get more Shouts has probably looked up the Graybeards. But ask someone if they've played Skyrim and they're bound to tell you about their character, that one time they found this magical glowing stone over there, or that adventure they had in a mine full of trolls. Pretty much everybody who's played Skyrim has their own unique story to tell. Orphaned by the criminal scum of Skyrim at a young age, I vowed I would rid this land of all evil-doers. Through intense physical, mental, and magical training, I honed my body to be the the perfect weapon against crime. Taking up the mantle of a bat, I strike fear into the cowardly and superstitious underworld that plagues my fair region. I am darkness. I am the night. Also, I'm a Khajiit. Or at least I was CatBatman. One night I tracked down a group of vampire hiding in a nearby cave. They had taken the life of a nearby villager, and that was not an offense I would forgive easily. In a different world, a bat-like man might fight unarmed and have taken an oath not to kill anybody. While I also fight unarmed, I prefer to piledrive my enemies into eternal slumber. Using the shadows, I took out the ghouls one by one until i reached a larger chamber. Four vampires spotted me and attacked! I tried my Scroll of Fear, but it had no effect! Thinking quickly, I shouted in the ancient tongue of the dragons and the vampires froze in place. It was over. I easily vanquished the rest of the fiends with minimal injuries. Later I contracted vampirism and through a series of events became a Vampire Lord. That was the day I became BatCatBatman. But it makes sense everybody has a different tale to tell. Aside from the absolutely massive and open-ended word, stories in games just don't happen because of a few things scrawled into your quest journal. The story isn't just told through a few cutscenes or through some guy telling you you need to go kill some boss. Story can be conveyed by simply playing the game. If you've got a big enough playground an a whole ton of different ways to play, you'll wind up with all kinds of different wonderful little stories that aren't just fun and engaging, but unique and personal. This isn't just limited to Skyrim or open-world games either. Theres tons of stories about epic runs through an action game, dramatic match reversals in a fighter, or those sweet headshots in in on online FPS. Games are unique because they can tell stories beyond a script or set piece. Even something as little or insignificant as equipping a new item can yield a new story to tell that can be as meaningful and interesting to the player as the main quest. The wizard took a seat next to the bones of the newly slain dragon. He tossed a few items towards his follower and motioned for her to sit next to him. they both watched the sun set beyond the thick sea of frosted trees. "You know, it seems like forever since you joined up with me, Lydia." Said the wizard. "Back then I was just a lad who barely knew how to shoot a flame spell. Now I'm summoning demons to kill dragons for me. And all that time you've stuck with me. Through thick and thin." "As your Housecarl, I am sworn to protect you with my life and carry your-"
"Enough with that!" the wizard said in frustration, "Nobody, not even someone who took the greatest of oaths, would have fought with me through the Dwarven dungeons while carrying 700 pounds of crab meat and metal bars." "No," the wizard stood up, "There is something that is keeping you here with me that goes beyond a simple oath. I think you have fallen in love with me." The wizard clutched the Amulet of Mara that hung around his neck. "As I have fallen in love with you." The wizard took Lydia's hands had helped her to her feet. "Lydia, I have a new oath for you to consider; would you become Mrs. Radbeard Thunderbottom?" Hey all thanks for reading my article! 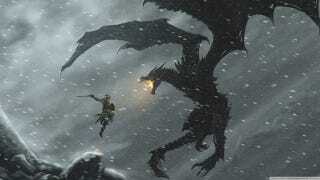 Got any awesome stories from Skyrim or any other game? Well share them in the comments. I actually love reading stuff like that. Also I got a Twitter if you want to follow that @invadingduck. Usually it's dumb stuff, but sometimes I accidentally say smart things. But mostly dumb fan-fiction mashups.